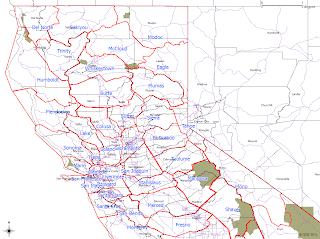 A while ago I started a project to redraw the counties of California. This morning, for no reason I can discern, I suddenly had the urge to complete the project. And I did, at least as far as I'm willing to take it. 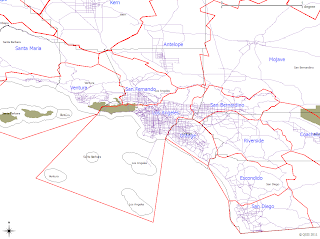 And here's the final result: new maps of Northern, Central, and Southern California. I also made a few exports from the GIS program I used to determine where to place the boundaries. In these images, the old borders and county names are in black, the new borders are in red, and the new names are in blue. In the background are major roads in light purple, and national parks in olive. Gone are all the arbitrary lines laid down when the surveyors divided up the land. The new boundaries mostly follow either watershed divides or major water bodies. There are exceptions, but I tried to limit them as much as possible. The straight lines that you can see here exist because the boundaries I drew are approximations. If this exercise were ever to be repeated for real, almost all of them would go away. 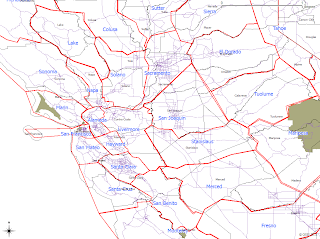 I ended up creating 13 new counties (McCloud, Whiskeytown, Tahoe, Hayward, Livermore, Shaver, Santa Maria, San Fernando, Antelope, Mojave, Palo Verde, Coacella, and Escondido), eliminating 14 (Shasta, Tehama, Glenn, Yuba, Nevada, Placer, Yolo, Amador, Calaveras, Alpine, Contra Costa, Madera, Kings, and Santa Barbara), and renaming 1 that had its signature feature removed (Eagle, from Lassen). I significantly reshaped nearly every existing county. The two least changed were San Francisco and Orange. This image shows some of the other layers I used for reference. 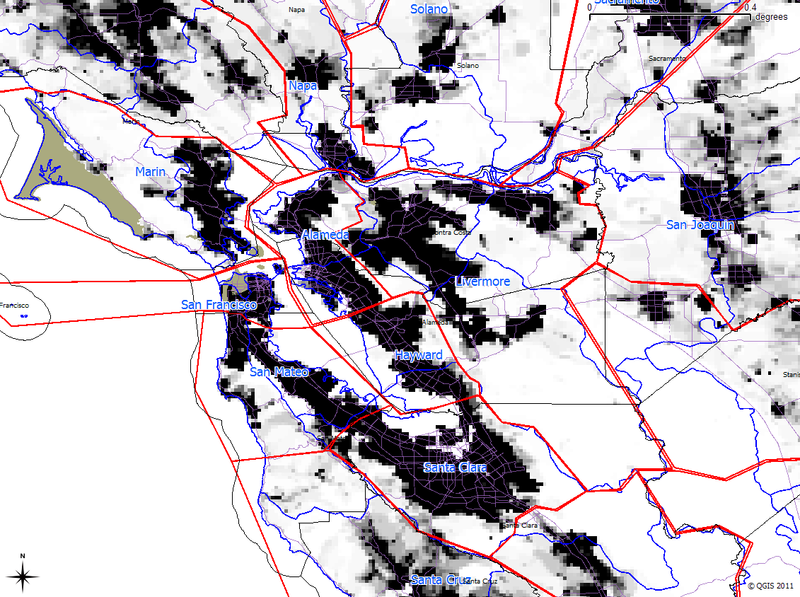 Watershed outlines are in blue, and population density is represented by shading from light grey to black. None of the resulting counties are ideal, and several have significant problems. 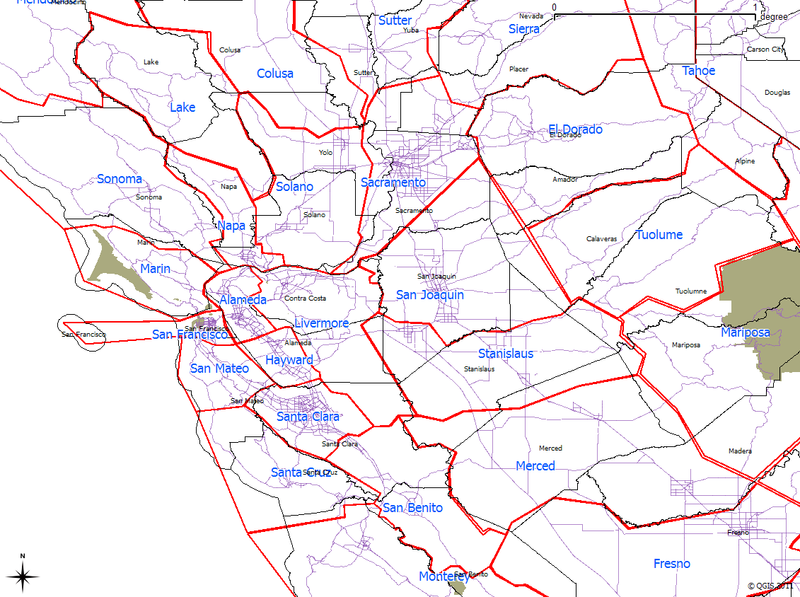 Tulare County, for instance, is larger than I would like, but there is no non-arbitrary way to divide it. McCloud is probably underpopulated (though not any more so than neighboring Modoc). And so on. 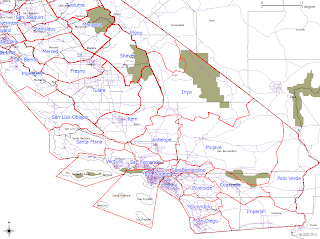 On the other had, the most problematic counties have been resolved in one way or another. The minimally populated Alpine County has been eliminated, with the area mostly absorbed by Tahoe. 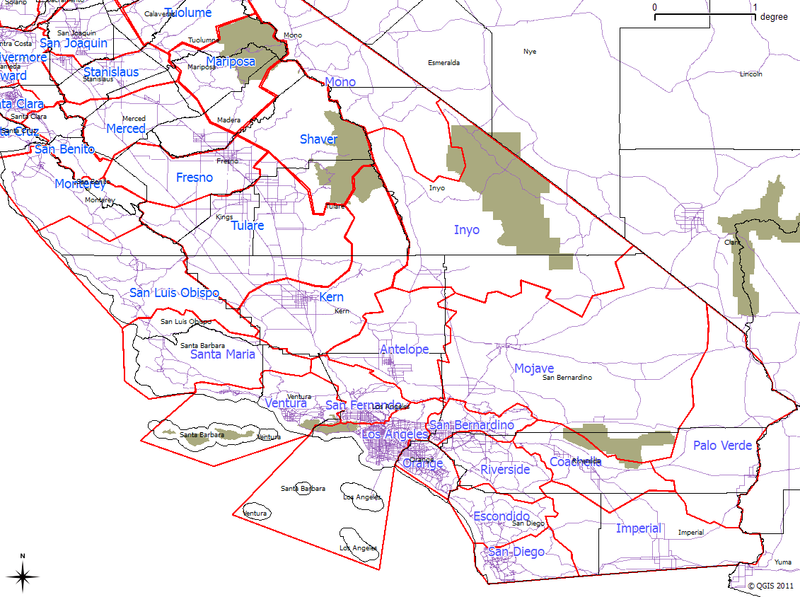 The ridiculously large San Bernardino has been divided between five different counties (though Mojave is still bigger nine states). 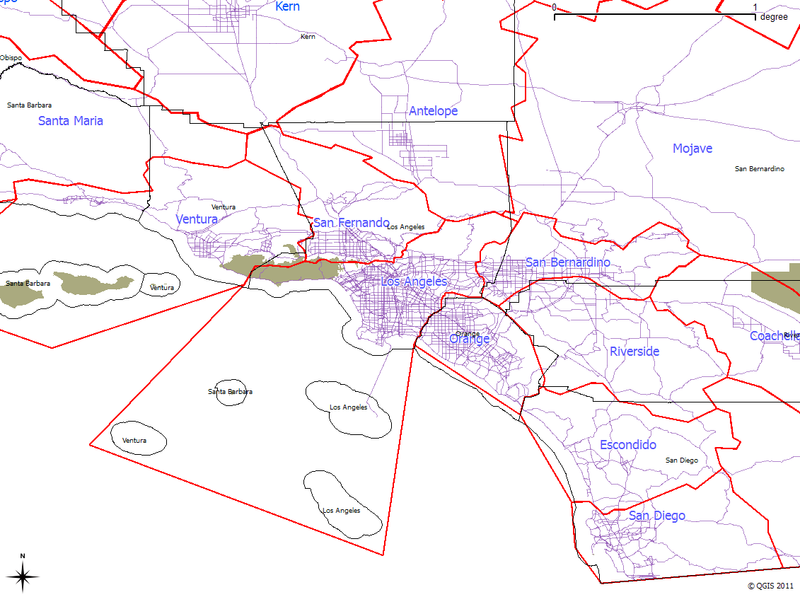 And Los Angeles is now entirely south of the San Gabriel and Santa Monica Mountains. If there's a takeaway from this effort, it's that it is a good example of how poorly governed America currently is. 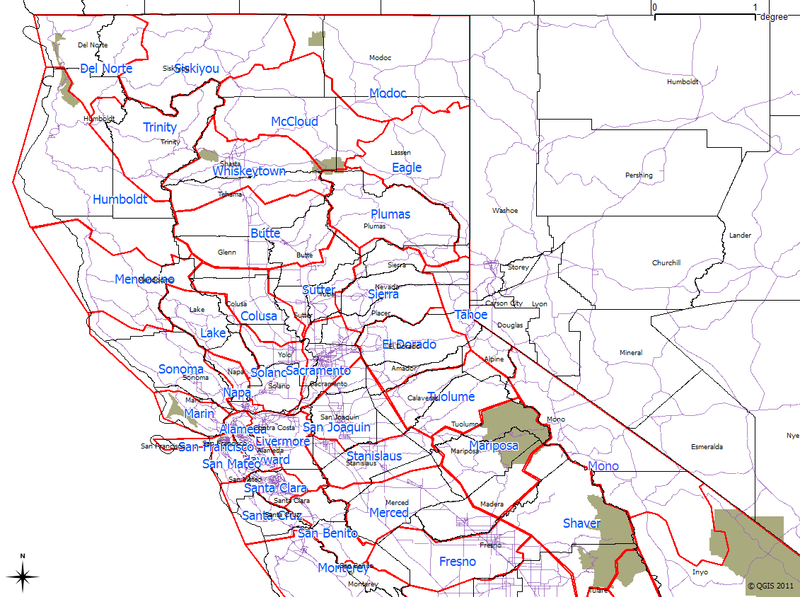 There's no reason for the counties of California to exist as they do. They are artifacts of a situation where a literate, industrial culture invaded the lands of a number of pre-literate cultures that had been decimated by disease and warfare. If we better governed, somebody would have identified obvious problems like the size of San Bernardino, and organized society to resolve them. But for many reasons, nobody has done so. That should cause us all to worry a bit. Great post with quality pictures and content.